What’s included in your shipment: . The pROSHI on sale at Mindmachines.com comes with a battery charger and three pairs of glasses. Since each brain is unique, you may or may not have the same reaction to the light colors as suggested below. See the section below on how to change the color and flicker of the ROSHI multi-mode glasses. IND IGO (Red/ Blue leds) Oceanic (Blue/Green) and White see-thru. For most people, the lNDlGO seem to have a cal ming, yet energizing effect. This may work well for you to do in the AM or before any activity where you need to be focused . OCEANIC’s blue green colors will calm and relax most people . There is documented knowledge of the healing ability of the colors b lue and green. This would be a good choice for meditation or at the end of the day. White See – thru glasses: These glasses allow you lo multi-task by doing reading or studying or even watching a movie or TV while you are doing a pROSHJ session. Operating Instructions: Take the black box out of the shipping box and select a color of glasses. Plug the cord end of the glasses into the front of the black box in one of the dual port s. Turn the on/off switch located on the back of the pROSHI instrument by clicking it once to turn the machine “on'”. Choose a pair of glasses and plug them into the front of the box in one of the parallel ports. Adjust the knob in the front located next to the plugged in glasses to set the light intensity of the flicker. You want the level of light to be comfortable. To stop a pROSHI session, you will need to remove the glasses, and turn the pROSH I to the “off” position by clicking the switch in the back of the pROSHI “in” to shut it off. The battery has been charged so you will able to experience several sessions before recharging . You should keep your pROSH l charged by inserting the battery charger in a wall receptacle and plugging the cord end into the back of the pROSHI near the on/off switch. Keep the pROSHI turned off while charging for the best battery life. Your pRO SHI battery should last for 24 hours before needing a recharge. Since the pROSHI does not read or use the EEG, it is more of a ‘global’ brain training device. The pROSHI’s LED flicker is of a ‘standardized’ nature and the brain, copycat that it is, is induced, to duplicate it. It represents a model of the “perfect” awake state for the brain. If the brain can be trained to be quiet, the more it will wake up to the possibilities open to it. This will return the brain to its original attentional flexibility. This is the perfect meditation tool as it places the user in the “quiet zone” where real meditation can take place. You should sense or feel the relaxation response, when you can see the flicker, on your eyelids. The rate of light intensity is up to the user. Sensitive people such as those with a history of Asperger’s or TBI, PTSD, and such, won’t be able to handle full brightness. Most brains will simply feel relaxed, awake and aware. Connectivity charts from qEEG’s in ongoing research are showing that this happens the moment the pROSHI is started, on any brain, regardless of the internal problem. You should have a therapist, and documentation to monitor the changes that will take place. The way the pROSHI works is to send precision timed ‘brain-like’ signals to the brain. If there is any slowing along the pathways, the brain immediately boosts blood profusion to these regions, in an attempt to smooth out information transfer. At this point, some people may experience a slight headache in the frontal region and this can usually be corrected easily by some deep breathing. You may also want to reduce the light intensity and/or stop the session briefly. Just set the LED lightframes to just below a comfortable level and go. The simple instructions are to ‘gaze’ past or through the flicker with your eyelids closed. What the pROSHI is doing is to provide a standardized proprietary wideband scanning signal onto which the brain, will ‘mimmick’ or, try to ‘lock’. The brain will remain ‘locked’ for about 15 minutes, maximum. As your trainings proceed, these focus times will extend and, you will be able to run longer training times. It should not tire you out as the brain will make its own rest periods within the training session. Although the task is the same, for every brain, the degree of difficulty varies, with the inner communica tion conditions of each brain. Start slowly. The more that they can’t handle it, means the more that they really do ‘need’ it. A healthy brain can handle the pROSHI full blast, and feel relaxed and clear at the end of a session. Some are known to become mildly addicted to it. The ‘ultimate’ goal is a flatlined EEG, of a wide-awake Zen monk , with a brain/mind totally at rest and relaxed. The phase switch is the switch located between the knobs on the front of the pROSHI instrument. This switch directs the current to the brain (by the light flicker) in a clockwise or counter-clockwise manner. It changes the phase rotation. Some say that it makes them “feel” in a giving or receiving mode. On some folks, it can cause some somatic responses. Any “negative” reactions can indicate that this is an area, which needs more work . Further training, done in short sessions, should eliminate the reaction while increasing the flexibilty of the brain. Please check with your therapist before making any changes to the light settings on the lens or using the Phase switch. It is a good idea to have follow-up sessions periodically with your therapist so your progress can be evaluated and any changes discussed. Each of the ROSHI Multi-Mode glasses (Oceanic and Indigo) have a switch on the inside left lens. For most sessions, you should leave the glasses set as they come from the manufacturer (IC-0) Start with IC-D. This drives both hemispheres, in parallel. What is the difference between the SV switches on the glasses? When the glasses are set in the lC/D position, both eyes are driven, in parallel. This is the most generalized setting. The magstims are delivering the same wave as the lights, but the field is focused on the brain’s limbic system and brainstem, the pineal gland in particular. The magnetic fields, of the coils are continuous in step w/ the LEDs. Where both eyes are stimulated in non-parallel sequence. The GBD (green/blue/double) or RBD (red/blue/double) switch controls which color is separated into individual eyes or both at the same time (CD-double). Using the ‘G” switch on the Oceanic pair of glasses will move only the green color to the left eye and blue color to the right. The “Il” switch will move blue to the left eye and green to the right. The result of using all of these settings is to cause the brain/mind to be flexible and to operate, from its quietest baseline. **Researchers may want to try these other settings on the glasses. You may also discover that the brain processes colors in different ways. Both the Oceanic and lndigo glasses offer this option. 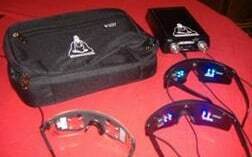 *MagStim glasses are by special order only and are to be used under the supervision of a therapist . The magstims deliver magnetic waves in the same fashion as the lights. but the field is focused on the brain’s limbic system and brainstem, the pineal gland, in particular. The magnetic fields, of the coils are continuous, in step w/ the LEDs; and not pulsed, so there is no decay time, between transitions. Magstims can be used either in the normal glasses position over the eyes or set on top of the head as you might place sunglasses. When used in this position, you can also us the other glasses included in your kit over the eyes by plugging them in the additional port located on the front of the pROSHI box. It is strongly advised that you be evaluated, by a Neurofeedback therapist, before using this instrument. He/she will most likely giv·e you an implied consent form to sign before using the glasses as there is slight risk for instigating a seizure with clients who are prone. The pROSHI is a meditation and peak performance tool. It is not a medical device. This device is not intended to diagnose, treat or cure any physical problems or medical conditions. Information on this sheet is intended to be used for educational purposes only. The statements on this sheet have not been evaluated by the FDA and as such shall not be construed as medical advice, implied or otherwise. No medical claims are made for ROSHI products , express or implied. They are not medical devices and should not be used for the relief of any med ical condition. Please consult wi th you r licensed medical practitioner prior to use for any other purpose as the machine is not intended as a replacement for medical or psychological treatment. This product is not intended to affect the structure or any function of the human body. This product is not approved for any purpose by the FDA. Copyright Chuck Davis. Posted with permission. There are posts all over the internet that describe how people are supposed to sit while meditating. It’s like a generic ‘everybody should do it this way’ one-size fits all. That is a load of crap as people are of different shapes and sizes, some have sensitive physical problems and others have disabilities. But these guidelines lead people to believe that is the way one should sit during meditation. People have the idea that they have to sit in a certain posture for effective meditation, and yet they find it is impossible to do so comfortably. If you are physically uncomfortable this will dominate your awareness and it will be impossible to relax. Forget what self-described meditation ‘professionals’ say and sit in a way that is comfortable for you. Sitting during meditation is the most common way. Try to sit with your spine erect without straining. Don’t give it any thought, just sit the way you naturally do. Perhaps both feet on the floor with back support? If you find yourself still thinking about your posture when you’d hoped to be meditating, consider getting personal assistance. The finest mind tool is the DAVID Delight Pro. Consider incorporating the DAVID Delight Pro into your meditation regimen. The DAVID Delight is much like a mantra, call it an ‘Artificial Mantra’, that unifies the brain to act in sync. You become focused and stay focused without awareness during your entire meditation experience. You are still, comfortable, and in the process of training your mind, body and spirit simultaneously. That is meditation. By incorporating the DAVID Delight Pro into your meditative sessions, you are experiencing what is referred to as Western Meditation (eastern wisdom and western neurotechnology). With the DAVID Delight Pro as an adjunct to your meditative sessions you will realize sitting ‘correctly’ is no longer an issue. It’ll just occur naturally. And your quest towards singularity will become easier to achieve. The whole reason for meditating, for seeking the elusive state of nothingness (singularity) is to toughen you up… just ask a monk! stress and anxiety levels as we cope with daily activities. being, at will, is an achievement meditation can provide. technology to enhance every meditative session I experience. receive when combining my Delight Plus with meditation. Sometimes while meditating we become uncomfortable with feelings that surface into our consciousness. Such feelings encompass emotional or mental thoughts or physical sensations. As we meditate we become less focused on what’s going on around us and are more inwardly aware, including subconscious feelings that have been just below our conscious threshold. Just go with these feelings and resist the temptation to stop your meditation exercise. Yes these feelings can make meditation a struggle but do not give in to them. Our mental, emotional and physical sensations continuously fade in and out. It is mind’s natural flow. Let them pass. As you become aware of the sensations simply allow them to be consciously present. Do not dwell on them or try to push them out. It is okay to be aware of the emotion, to notice where in the body the feelings exist, and allow your awareness of these sensations to be emotionally present. The emotion should diminish. As the sensation and emotion diminishes, let go of the emotion your mind is trying to define. There are times that during meditation things can arise that are emotionally very difficult to deal with. It could be a repressed memory from the past or the need to modify a personal behavior pattern. For times like this you may find getting outside help beneficial. A very popular and highly effective method for dealing with difficult emotions or feelings is to use the DAVID Delight Plus meditation trainer. Allow the photostimulating frequencies a couple of minutes to interact with your mind’s brainwaves and suddenly you realize the internal chatter has stopped, your mind is quiet and is in listening mode. In this very deep, timeless state, your mind has begun to repair itself through the process referred to as photo-disentrainment. The DAVID Delight Plus acts as a personal meditation trainer that gently enables your mind to let go and receive the full beneficial effects of attaining deep meditative states. 15 years ago Michael Landgraf and Christopher Oliver donated light and sound mindmachines to the Braille Institute to learn how effective the audio aspect of light and sound stimulation affected visually impaired individuals. The benefits were immediately apparent. This experience and the feedback gained was a primary reason for the creation of the Virtual 515 dual-independent-binaural-beat audio frequency sessions (available today as immediately downloadable MP3s). Recently our attention has turned towards helping the hearing impaired. Visual stimulation is a safe and effective modality for promoting deep meditative brainwave states, for shedding stress and coping with anxiety and depression. Not to mention the patience needed when adjusting to newly acquired hearing aids. Unable to hear the audio frequency generation nixes a great many products designed for wellness and coping skills. Michael and Christopher spent several years experimenting with various devices that could prove positive to those with hearing loss and the 2 channel personal Roshi, with it’s binaural visual stimulation exceeds all criteria for meeting the specific needs of hearing impaired people. This visual stimulation generates algorhythmic frequencies that differ for each eye, creating a three dimensional visual affect, calming brain chatter, healing brainwave pathways and enabling the mind to drift very deeply, where time slows and listening begins. This pRoshi 3D NeuroDynamic Activator is the popular choice for those with hearing impairments. The pRoshi is simple to use. Connect the light-emitting RoshiFrames, turn the pRoshi unit on, adjust the pulsed light stimulation brightness (intensity) and enjoy! The pRoshi comes complete with pRoshi unit, two pairs of 3D RoshiFrames (red/blue and green/blue), ac adapter and storage pouch. Copyright: Mindmachines.com (2013) Granada Hills, CA. All rights reserved.